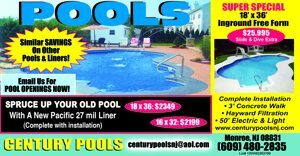 ● Century Pools Does Not Rely on Sub-Contractor Installers. We install our pools with the Care and Quality Workmanship that comes with over 35 years of Pool Building Experience. We warranty all workmanship (materials & labor) for 7 years (filtration system is subject to service agreement to insure proper winterization of pools). ● There are No Commissioned Sales People. We will help you choose the pool that is just right for you.